A two-hour smorgasbord fiesta safari of Austin independent theatre! 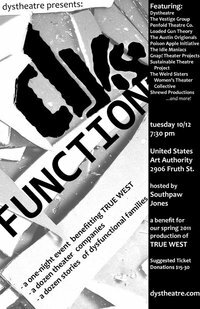 An event geared to bring a bunch of Austin theatre groups into one room to show their stuff, and to help raise funds for Dystheatre’s 2011 production of Sam Shepard’s True West. The DYSfunction is a night like no other. Hosted by the inimitable singer/songwriter Southpaw Jones, a dozen theatre companies will each perform a scene related to familial dysfunction. There will be a raffle for prizes. You can win ice cream, Flipnotics gift cards, free cuts from Birds Barbershop, and Frontera Fest passes.